Home » 2010 - The Caucasus » It’s unusually hot for the time of year! It’s unusually hot for the time of year! Now we are back in the EU we’ve spent a bit of time catching up with our families and have learned that the weather hasn’t been the best back in the UK. Well, you’d all better brave yourselves as we will be home in a few weeks and with us the heatwave and an Indian summer will arrive! Since we left Turkey the first time every place we have visited has been exceptionally hot. People have told us so many times “Its unusually hot for the time of year” that we’ve lost count! And, when we’ve left an area we’ve checked the weather forecast and it has almost instantly gone back to normal. Even now as we crawl slowly back through the Baltic states and northern Poland the weather is lovely despite our weather forecasts telling us it will rain! We must surely be coming to the end of our luck soon but we are now available for bookings for weddings and parties to guarantee lovely weather for any occasion! We are now near Gdansk and this part of Poland looks very prosperous and pretty. Its a bit like a cross between Germany and Holland. There are dozens of lakes and it seems every house sits on the edge of their own private lake. The towns look nice too, but we haven’t really stopped to investigate. We will have to come back here in the future and visit Latvia and Lithuania too as they are gorgeous picturesque countries. We have stopped for one night at the Wolf’s Lair – Hitlers bunker complex near the Russian border which was blown up in 1945. This area of Poland us inundated with bunkers, but Adolf’s is the one that everyone seems to visit. It was absolutely heaving with visitors and we got to walk round inside his bunker, or what was left of it, which was a strange feeling. 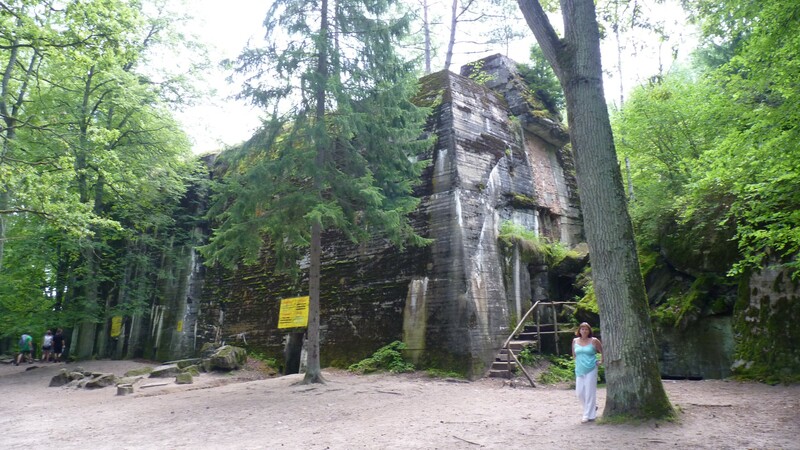 The bunkers are enormous, even after demolition and are hidden in a lovely forest with surprisingly few birds singing but it was a very interesting visit. It also seems to be the turn around point for motorhomes in drives North. We’ve seen very few motorhomes since leaving Russia but after leaving the bunker there were hundreds of them on the roads. It seems people view the Baltic states as too dangerous to visit still which is a real shame as, from the little we saw, they are gorgeous. Our only other stop was to see two enormous railway viaducts which cross a gorge in the middle of nowhere. They were built around WW1 and served a sleepy line the equivalent of Onehouse to Stowmarket which only ever had 3 trains a day. First one was built then a few years later another. It is quite odd especially as the line closed a long time a ago and they now lead straight into a wood.